Gjertrud Schnackenberg’s Heavenly Questions, a masterpiece from an exceptional poet, has received rave reviews. But there is, as far as I could find, only one video if her reading an excerpt from it, which is on the Website of the Griffin Prize, which the book won. I’m including it here, even though it has an introduction to the author prefacing her reading. You can see she becomes quite emotional during the reading, even though what she speaks about is not apparently personal, showing how deeply emblematic this poem really is, and how its imagery is grounded in something human and heartfelt, yet expressed in the grandest and seemingly philosophical imagery. The whole poem is an overwhelming experience, but I do wish she would record more excerpts from it, such as “Sublimaze,” which Harper’s magazine published just before the book came out. Also, you might check out this interesting review of the book and the reviewer’s take on Schnackenberg and her significance as a poet. Surprise! My Poem “Gently Still Finding You Between” on ASPD!! Just now I discovered that Autumn Sky Poetry Daily has published my poem, “Gently Still Finding You Between,” which I wrote in memory of my sister several years ago. (It seems like barely yesterday!) Thank you thank you, Christine Klocek-Lim!! 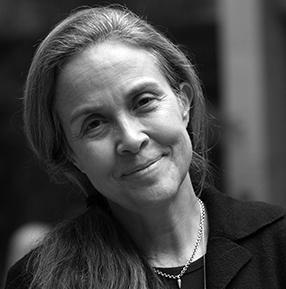 Without her having the slightest idea, Naomi Shihab Nye changed my life. After years away from poetry, I read a few of her poems and decided to break the silence. Then a couple years after that, my sister died, and the floodgates opened. But Naomi Shihab Nye was the seed, the spark, the one I felt made it a possibility, even an imperative, to devote my time to poetry. Here is a particularly fine poem in a field of fine poems, getting to the heart of things, which is what she does best. 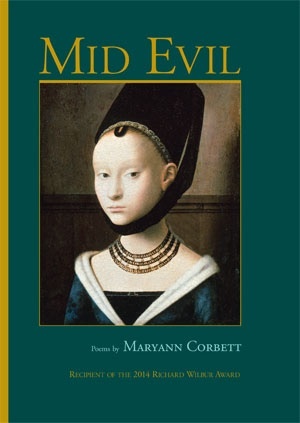 Maryann Corbett, a poet about whom the word “virtuoso” comes to mind, has succeeded in creating in her new book Mid Evil, a collection of poems so cohesive and penetrating that even the cover seems to be part of the overall poem-world within. Both gorgeous and sinister, its darks and lights beckon us deeper to where that dimly seen image in the mirror flashes into focus for tantalizing moments. And so we open her book, which includes translations of actual medieval poems – Corbett’s renderings of Old English, French, and Latin poems from the era, in which she is well-versed, are strikingly contemporary and real – as well as her own. mapless in Middle Earth and muddling through. Kitchen curtains part: a stage-set morning. that label life an interlude of prop arrangers. The light-play deliquesces in a blink. And this shows to me Corbett’s more profound understanding of things medieval. One of my most influential college classes was Medieval History, in which our professor insisted we learn from original sources and spurn historians’ stereotype-ridden rewrites. The take-away for me was a discovery of the Middle Ages as a world where the “plainest facts” were imbued with meaning, where personal relationships were treasured over objects, things. How in the light of a higher vision, without artifice, one can find “the rude devices” mere props in the greater “illusion,” in which one fervently believes, about which one deeply cares. This worldview seems to infuse this book, and reading it has an almost religious feel. And of course there’s more, but again. This didn’t win the Richard Wilbur prize for a few choice insights. This book won because people who love to read found that the reader who gets between these pages will be totally rocked. What would a Poetry Month be without the immortal Wislawa Szymborska? This is just one poem. Maybe I should post 4 or 5 poems, just for good measure. It is her vision that proves it’s the vision that makes the poem. The skill is in allowing the poem to create that vision as a vision inside the reader’s mind and heart, the heart being a word or place wherein resides one’s essence. The poem is simply a map for that vision. Everything here is small, near, accessible. with the river lying just beside it. you couldn’t lose your way among them. are out of the picture. as if they wavered—to be or not. Whenever I would encounter a poem by Stephen Kampa, it always stood out in the crowd: always a surprising take on things, a mastery of form, a way of drawing you in. Humor mixed with subtle pain. Here is a poem I especially like, for how it shows the author’s vulnerability (often this is a feature of his work) and at the same time deft and confident voice, always with the unexpected without being incomprehensible. Was Dies Irae, which I love and hate. Could enter you and rumble through your blood. But to discover fearfulness in light? You’ll always find a little more to lose. Until you find how much there is to gain. Of having to abandon certain things. There’s nothing that I wouldn’t want to keep. Drop through the grate. Devotion, of a kind. The myriad, blending voices just her voice. UPDATE: The wonderful Ellen Kort has passed last Tuesday, sadly. Our condolences to all her family, friends, and fans. And “fans” includes me. I will post more of her work in the future. Every day it seems I discover a new, amazing poet — one of the perks of National Poetry Month. Ellen Kort is all that and more, a unique and beautiful voice that I find gives meaning to the word “enriching,” as if I’d found a treasure with properties of magic. This seems to be one of her most-loved poems, with good reason. The inimitable A. E. Stallings’ poem takes us on a trip to a cliffhanger. Nice postcard! That outer space through which we were to plummet. And sliced the tedious sea once, like a knife. Somehow we struck an olive tree instead. Surprised by sunlight, air, this afterlife. and put a strong young blonde one in her place. a leap of faith from a doomed attempt at flight. dreaming we’re alive, that we’re in love.